Our 17th Century Reproduction Large Onion Bottles. These types of onion bottles were made during the late 1600's and into the 18th Century. These make perfect glass bottles for pirate and colonial era use. This type of short squat onion bottle was an evolution of the taller onion bottle. 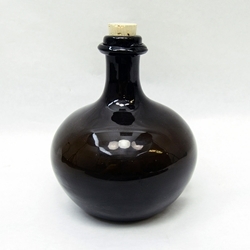 This type of bottle was used to store water, oils, wines and vinegar. The bottles come with a cork and each one is hand blown from green glass. They stand approximately 6.25 inches tall. Imported.